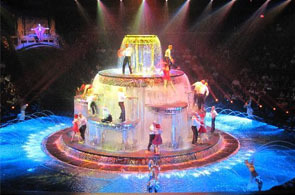 An aquatic spectacular performed in a domed theater in the round, Le Reve presents a small collection of imperfect dreams. In the theater, every seat is in the round. Uniquely intimate and spectacularly personal, no seat is more than 40 feet from the action. The show is a completely new form of staging and artistic performance, where the theater and water are alive with a translucent energy. 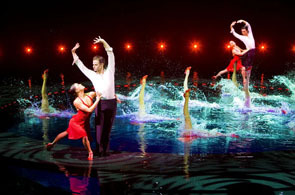 "My aim with Le Reve is to create an entirely new universe, to transport everyone into a world where the theater, performance and audience become one and the same reality," says Franco Dragone, the internationally acclaimed director, whose credits include O, Mystere and Celine Dion: A New Day.